Pinterest is a dangerous thing. All these gorgeous vintage dresses that get re-pinned I just HAVE to make for myself. They are always in the tiniest size, I could never own one of the original beauties myself. I'll just have to make my own versions! My dress was inspired by this green striped shirt dress with the detachable scarf. I found a light blue striped shirting at Mood, very close to the original mint green. It's very light weight and silky. I cut the fabric on the crossgrain to get the stripes vertical, like my inspiration. Also I am hesitant to wear horizontal stripes. I had a pattern in my stash that was similar to the original dress, with the exception of the collar and bow, vintage simplicity 3338 from 1960. 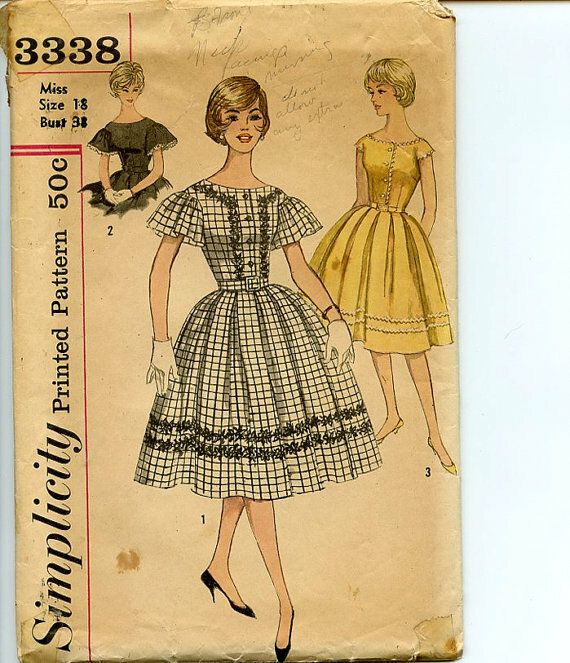 This simple version, version 3, without the square dancing sleeves, even includes a ric-rac trim. I will have to try this out another time, I am obsessed with ric rac. Even though my pattern is a bust 38, I still had to tweak the fit. The top button fit but everything down from that point in the front had to flair out. The back in my muslin fit almost perfectly to I left that alone. It is still pulling a hair in the front, so I will have to adjust that if I make it again. I tried my best to make the stripes match up in the front and shoulders. The skirt also has three seams that are invisible due to the stripes, making it easy to sew together. I had the buttons covered by Pat's Custom Buttons and Belts, and got them in record time (from across the country) Love this service SO MUCH. I should have got a belt too, but oh well. I will eventually make the scarf to wear with this dress, like my pin-spiration but I think it's cute without it. Are you obsessed with pinterest? Ever copy a vintage dress? Beautiful dress! 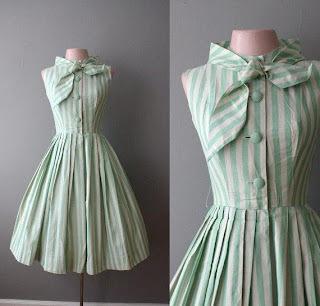 I love striped material for a shirtwaist dress, and that minty color is perfection. it turned out almost exactly like your inspiration dress! I get sucked into Pinterest. But, I mainly use it for my own organizational purposes. It's a great way to keep track of things. This dress, especially with the addition of your fabric covered buttons, is amazing! wow! the dress came out beautiful! Gorgeous - Pinterest is just dangerous isn't it, I can waste so much time there! I agree on the dangers of Pinterest. And you did a great job on the dress: it looks fantastic (like everything you make)! Those are the PERFECT cap sleeves. Adorable!